Olivia Kasper has been a part of the equine industry for the majority of her 22-years. As a young rider, Olivia competed in the South American city of Bogotá, Colombia. Now, Olivia helps around her family’s private Georgia horse farm. Additionally, she works with her younger sister to handle their horses’ training needs. Their first project horse just made his successful debut as a Grand Prix Jumper in fall 2018, with her sister in the irons. 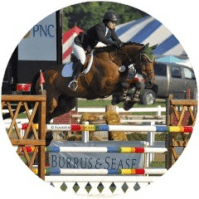 While balancing college classes, and show jumping competition, Olivia says a couple of things help her stay focused. First, a sense of humor and secondly, an uncomplicated approach to life. Discover this independent amateur equestrian’s column Show Jumping’s Ringside Redhead on the third Wednesday monthly.